The publishing industry was in raptures today with the announcement of the imminent digital arrival of BARNEY THOMSON ZOMBIE KILLER, the short novel in which Barney Thomson kills zombies. Previously published online as Government Of The Living Dead, the book has been re-drafted, topped and tailed with remarkable scenes set in Millport to give the book greater continuity within the whole Barney Thomson oeuvre, and given the iconically mysterious new title, which has swept across the internet like a flesh-eating plague through cattle. 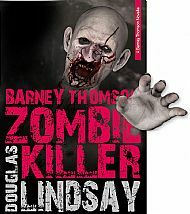 While Lindsay's future as the writer of Barney Thomson remains in doubt, following the Ebooks Will Eat Your Chilrden's Flesh debacle, experts are nevertheless predicting that BARNEY THOMSON ZOMBIE KILLER will be this year's fastest selling ebook, with downloads estimated at 14million worldwide in the first week.